We seek to put our belief into practice in a practical way, to benefit mankind. We have compassion ~ We reach out to serve the poor and the needy. We respect human dignity ~ We ensure that the elderly has the right to quality life, liberty, and security. 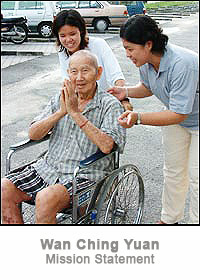 We care ~ We devote our time, talents, skills and resources to the elderly. We inspire ~ We teach by example the tenets and precepts of the compassionate Buddha. We impact ~ We ensure that what we do make a difference in the lives of others. To serve with compassion through teamwork. - Adopt an uncompromising approach for humane care of the elderly. - Practise professional knowledge and technical skills for qualitative and quantitative care. - Provide a beautiful, clean, serene, and safe environment for living. - Practise close co-operation and collaboration between staff and volunteers. - Provide continuous training for staff and volunteers. Wan Ching Yuen Centre for the senior citizens, is under the aegis of the Than Hsiang Buddhist Welfare Association. This Home was founded by Venerable Wei Wu on a charitable basis following the Buddhist spirit of "benevolence, compassion, joy, and equanimity". The primary aim of the Home is to provide personal quality care of the aged whereby they can lead a happy, meaningful and useful life. The subsequent aims are to provide facilities for the Buddhist fraternity to cultivate Buddhist teachings, as well as to enable and relieve working children the problem of caring for their aged parents while they are at work. The home started on a humble beginning on 1st May 1994 in a double storey bungalow house in Hogan Road, Penang , having a maximum capacity of 30 residents. It provides daily living and health care service for the residents. A variety of social and religious activities were organized to enrich the spiritual and quality life of the residents. The Home was managed by a qualified staff nurse and workers, assisted by volunteers. The Home provides free board and lodging for the genuine destitute. For those who can afford, a nominal subsidized sum of RM 450 as donation in helping the running cost of the home. Encouraged and motivated by generous public support, Ven. Wei Wu being a missionary had a foresight to expend and develop the Home to meet the demands of the rapidly growing aging population. A new 7 storey building was built adjacent to the existing Than Hsiang Temple in Bayan Lepas in 1995 and completed in 1997. This was made possible through the generous donations and support from the public. Eventually we moved to the new place on 5th July 1998. The new building consists of facilities for religious purposes, education, vegetarian restaurant and health clinic; besides facilities for the aged on the second and third floors for 60 residents , 6 day care and respire care for senior citizens. However the home was registered under Persatuan Kebajikan Than Hsiang Wan Ching Yuen , Pulau Pinang in 2008 and is now a charitable home for the poor and needy only. For those who can afford, a home was established at 5, Jalan Sg. Ara, Penang catering of 27 residents. Therefore, we need public support to assist us to run our charitable home for about 60 elderly in the Than Hsiang Welfare home, Bayan Lepas. Our operating cost about RM 450,000.00 yearly.